The PSNI have arrested a man on suspicion of sexual assault on a female in Lurgan. 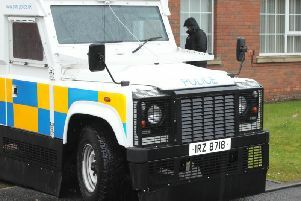 The arrest was made as police investigated a separate incident in the Portadown Road area of the town on Sunday morning. In that incident a female child was assaulted somewhere between the Portadown Road subway and the Old Portadown Road. There is no suggestion of a sexual assault in this case. When her friend tried to protect her, he too was attacked by the same male and two other accomplices. Police have appealed for witnesses to Sunday’s attack as they believe there were a number of people who may have observed the incident. The PSNI initially arrested one person in Tarry Lane for Assault Occasioning Actual Bodily Harm. A short time later, a second man was arrested on two counts of AOABH and then further arrested for sexual assault on a different girl. Writing on Facebook, the PSNI Craigavon said: “Some of you may have been woken in the early hours of Sunday morning by a police presence in the area of Tarry Lane and then Forest Glade. “Disruption is unfortunate. Sadly, it was necessary for a very disturbing reason. “We were made aware mid way through the night shift that a serious assault had occurred on the path somewhere between the Portadown Road subway and the Old Portadown Road. “A child - a girl - was attacked initially by one adult male, and when her friend intervened to try and protect her, he too was attacked by the same male and two accomplices. We believe this had happened earlier in the night, around 9pm. “As part of our follow up, we have established that there may have been numerous people in the area at the time, many of whom will have seen what happened. “Our first arrest in the Tarry Lane area was for AOABH. “A short time later, a second male was arrested for two counts of AOABH, then further arrested for sexual assault on a different girl. “We frequently warn of the dangers of children congregating in such an area, however NOTHING can justify this. Predatory thugs have no place in society, but without your help, it is hard to get rid of them. “If you’re reading this and witnessed any of the attacks, think long and hard about it. Parents, you may already know your child was there. You may however think they were at “a sleep over” or similar. Talk to your kids. Please, take one for the victims here and let them know they aren’t in any trouble by stepping forward. “Someone out there - probably several people in fact - witnessed this and can make a huge difference for the victims. No night out, regardless of where it is, deserves to end up like this. “The reference number is 1418 of 26/01/19. You can call us with info, private message us, or speak anonymously to Crimestoppers on 0800 555 111. If you’d rather, you can also approach local community reps who can pass information on to us.